Did U Know ? burning dead leaves is harmful – read the article to know how. Open burning of leaves, which has for ages been pretty much the norm for getting rid of fallen leaves in winter, has come under the scanner of pollution watchdogs for releasing huge amounts of soot, harmful particles and toxic gases aggravating air pollution. Sweepers and gardeners in public parks have been found burning leaves in large heaps. They have been doing this for years as a habit. Notices are served to civic bodies and other agencies too. Traditionally, burning of leaves in the winter has been an integral part of the maintenance of parks in the city, in order to prevent the huge heaps of dry leaves from adding to the municipal solid waste stream. But what makes this a huge problem is that there around 3,700 ornamental parks, almost 10,000 ordinary/neighbourhood parks and about 80 children’s parks across Delhi. “So the amount of leaves that burn in winter is just enormous. They are usually burnt in the mornings, mostly filling the area with smoke and soot,” he said. The Central Pollution Control Board (CPCB), in its soon-to-be published Source Apportionment Study, which pinpoints the sources and the amount of each air pollution component, has mentioned burning of leaves as a source of winter pollution in Delhi and elsewhere. That apart, burning of leaves and woods also release the cancer-causing organic compound called benzene and toxic gas carbon monoxide in large amounts, said Dr T.K. Joshi of Centre for Environment and Occupational Health at Maulana Azad Medical College. “Small children are at graver risk. Joggers and all who inhale more air in the morning are also greatly exposed to it,” he said. 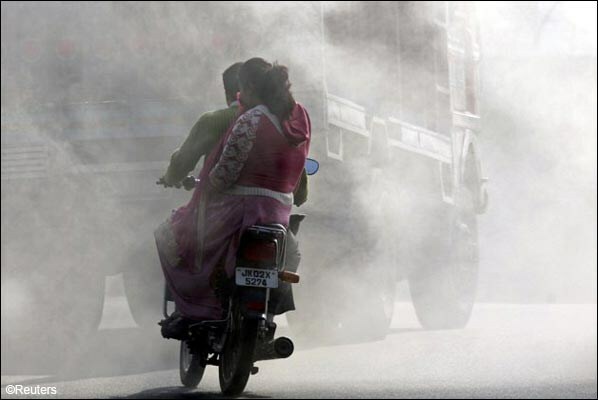 A UN report had recently called Delhi one of the most polluted Asian metropolises. Burning leaves also adds to the formation of thick smog in winters.